A good piece in today’s New York Times about the Burmese military’s efforts to stop any reprise of last year’s democracy protests led by monks. I’ve heard from inside Rangoon that the situation feels extremely fluid. I like to think Ahead of the Curve is one book which tries at least to paint the business life in something other than glorious, hand-clapping Technicolor. I think this is partly what has HBS in such a mood. He makes the fuss over the sub-prime bail-out look like so much chin-wobbling opera. 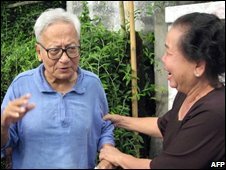 He is now 79 but was first sentenced to jail when he was 60 – for looking after a girl suspected of having an illegal abortion. Win Tin was one of 9002 prisoners set free, most ordinary criminals allowed out for good behavior. PEN is hosting a fundraiser tonight in New York for victims of the cyclone which hit Burma earlier this year. The most interesting sounding speaker is U Gawsita, a 28-year-old monk who helped lead the uprising against the government last year and is now in exile. On Friday, I attended a talk by Bhutan’s prime minister, Lyonchen Jigmi Thinley at the Rubin Museum in Manhattan. The Rubin is in the midst of a fabulous Bhutan program – with exhibits, talks and performances until December. The Prime Minister wore the traditional Goh, a thick embroidered jacket, and spoke about Bhutan’s transition from monarchy to democracy. He also described the country’s policy of Gross National Happiness, which has been well covered in the West – though I hadn’t yet heard such a high-ranking Bhutanese explain it. It came about when the King acceded to the throne in 1972, while still in his teens. He looked for social models around the world, but found none he liked. He believed that what people wanted more than anything was happiness – things like health, prosperity, education, were simply means to that. Economic development, he saw again and again, was pursued at the expense of the individual. So he made Bhutan’s national goal happiness. Plain and simple. The four pillars of Gross National Happiness are: the promotion of equitable and sustainable socio-economic development, preservation and promotion of cultural values, conservation of the natural environment, and establishment of good governance. Measuring happiness, of course, is a challenge. But the Bhutanese, with lots of help from curious well-wishers from abroad, try. Among their findings: rural people are slightly happier than urban people; cultural participation and identity is the strongest determinant of happiness among both groups; religious people tend to be happier. You can read more about GNH here at the Center for Bhutan Studies site.